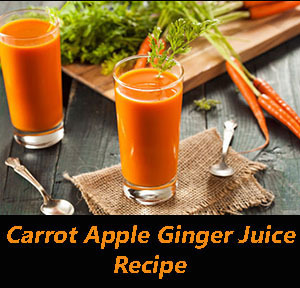 There are numerous health benefits you can enjoy by drinking this carrot apple ginger detox juice on a daily basis. First, ginger root can reduce nausea, pain and inflammation. It can also provide heartburn relief to those who struggle with that. Other ingredients such as apples will help protect “good” cholesterol levels in your blood. Did you know carrots are actually the richest plant source of vitamin A? They’re also a great source of potassium as well! 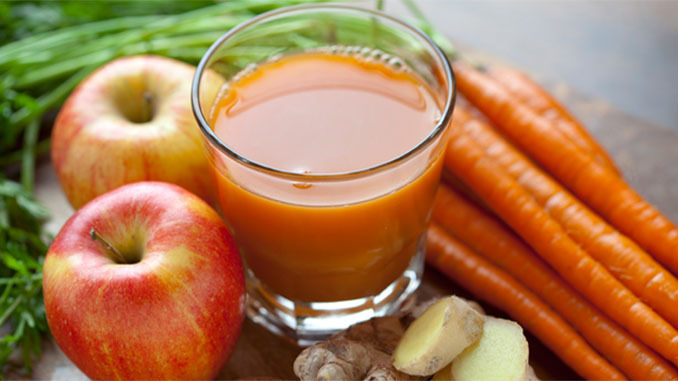 With all that in mind, the carrot apple ginger juice recipe on this page is a great choice to drink in cooler weather. But, it can be enjoyed any season of the year! This refreshing detox juice provides antioxidants, electrolytes and half your daily requirement of biotin. Gather the ingredients and follow the directions below to make yours now! 1) Wash all produce well before making. 2) Add all of the ingredients through your juicer. The recipe above will make 2 servings of 16-20 ounces (500-600 ml) each. This juice is wonderful to drink and enjoy while at home or at work. It only requires a few produce ingredients which you can buy at your local grocery store and takes juice minutes to make. One serving contains 199 calories, 11 g of sodium, 41 g of carbohydrates, 1 g of fiber, 35 g of sugars and 1 g of protein. Note: Yields and nutritional information are estimated and will vary depending on produce size and equipment used. Thank you the drink was fabulous.